Queens, NY Developer Triangle Equities has acquired a development site located near John F. Kennedy International Airport for $25.4 million. The project site is to be developed as a 300,000 s/f, multi-level industrial building. The facility will be one of the first multi-level, multi-tenant air cargo and distribution facilities in New York City. Triangle executed the land acquisition and development financing through a strategic partnership with a pension fund advised by L&B Realty Advisors, an acquisition loan from Citizens Bank and additional equity capital from Township Capital. The three-story industrial and air cargo facility will feature first and second-floor industrial space. Both floors will have loading docks accessed via truck ramps, permitting full-sized trailers to dock, load and unload directly into their floors. 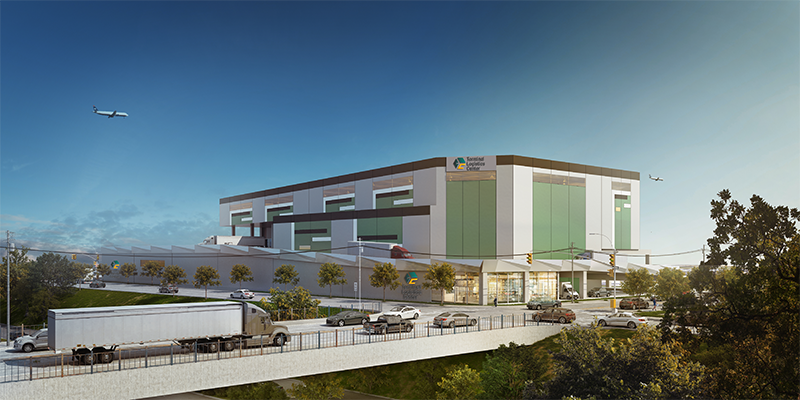 The project is focused to deliver new-construction, class A industrial space to the JFK market – currently underserved by such space – and will include market leading clear heights, heavy floor loads and large structural column spacing. This project aligns with the goals of the JFK Action Agenda through Port Authority of New York & New Jersey and NYCEDC and will contribute towards meeting the published forecast growth in the Action Agenda through increasing access to Class A industrial space abutting the airport, providing best-in class space to facilitate operational improvements, and more efficient and direct access to the airport for air cargo related service providers. Located one quarter mile from JFK Airport, the site is conveniently accessible and features frontage on the Belt Parkway. As the region’s biggest and busiest air cargo airport, JFK easily accommodates long-haul direct and nonstop international and transcontinental traffic. The property is also located near the Port of New York & New Jersey, one of the largest natural harbors in the world and the third largest port in the U.S.
Triangle Equities worked with Holliday Fenoglio Fowler, L.P. (HFF) to arrange the investment in common equity and to place a $19 million, floating-rate loan with Citizens Bank for land acquisition and pre-development costs. The construction manager for the project is March Associates and the design architects are Craft Architects and GF55 Partners. The development is slated to break ground in winter 2019 with tenant occupancy expected in summer 2020.